Podcast: RotoRob’s Fantasy Baseball 365 Debuts! How will the move to LA affect Albert Pujols and the rest of the Angels? Yes, we know you’ve been waiting with baited breath since RotoRob.com launched five and a half years ago for the site to finally begin hosting its own Podcasts. Well, now that your face has a nice blueish hue to it, let no one say we are procrastinators, as on Thursday night, we debuted RotoRob’s Fantasy Baseball 365. Our new Podcast, which can be heard on Blogtalkradio Thursdays at 6:30 p.m. EST, features Buck Davidson, Tim McLeod and RotoRob bantering about all things Fantasy baseball. How will the Albert Pujols signing affect the Halos’ lineup? And what can we expect from Phat Albert this year? 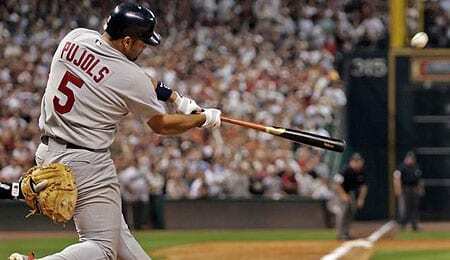 Back in St. Louis, how do the Cardinals fill the king-sized hole left by Pujols? Who steps up, and who moves where to fill in the gaps? Speaking of St. Louis, what are newcomer Carlos Beltran’s prospects for 2012? Are the Cards really going to bat him in the two-hole? The Miami (nee Florida) Marlins did their best to imitate the Angels’ drunken sailor spending spree this winter. Will the values of Jose Reyes, Mark Buehrle and Heath Bell change now that they’re in Southern Florida? C.J. Wilson should improve with his move to Angel Stadium. Right? Not so fast… apparently we have a disagreement about how the top pitcher on the market will fare after his move. This entry was posted on Friday, January 6th, 2012 at 3:15 pm	and is filed under BASEBALL, Buck Davidson, Podcast, RotoRob, RotoRob's Fantasy Baseball 365, Tim McLeod. You can follow any responses to this entry through the RSS 2.0 feed. You can leave a response, or trackback from your own site. Hi. Is the Podcast available on iTunes? I’d like to listen in my car but I couldn’t find it. Thanks. We’re looking into this for you. Please stand by!